When I discuss orange paint with clients, time after time, the conversation seems to go, "I'm much more comfortable with red than with orange." Look, people. Red is darker than orange. If you're going to be afraid, fear red, not it's innocent relative. Orange is, in fact, less risky than red. It is easier to paint over if you're unsatisfied. And it tends to be happy, and warm. Red can often read "siren," (in a bad way). Red can cheapen a room, with those who don't know how to manage it. Orange, on the other hand, is never sleazy. Push your comfort zone to include an orange wall or two. Perhaps just use it as an accent wall, or a small fraction of an allover stencil (think Moroccan tile motif). Or just paint that old chair to breathe some life back into it. You needn't be afraid of orange. Orange is your friend. Most shades of orange are flattering to us. At 14, knowing this fact, I painted my bathroom Persimmon (the exact color doesn't exist anymore, I've been looking for it!). So, every day during early teens, I looked in the mirror to see a girl with a beautiful glow. And, no, I wasn't delusional--it was common knowledge among my friends that doing hair and makeup at my house was the best for confidence. Fast forward to present day...these are some paint colors on the market that I love, and would likely recommend to anyone in need of a little "happy." My Benjamin Moore Color Preview paint fan. I gravitate toward the colors closer to the bottom, as they are much more pigmented . 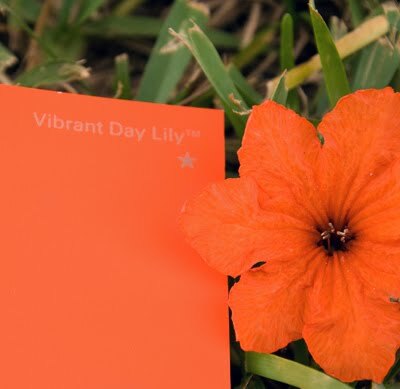 Glidden's Vibrant Day Lily. One of my all time favorites. Before you go slather your walls in a deep orange, you must use a primer. Primer is a special type of paint to "prime" a wall for a color different than its existing hue. Primer is really important when going from white to a saturated color (especially red), as it prevents a splotchy effect. Think of primer as a palate cleanser, designed to provide a blank slate. Yam by Sherwin Williams. Makes me hungry. 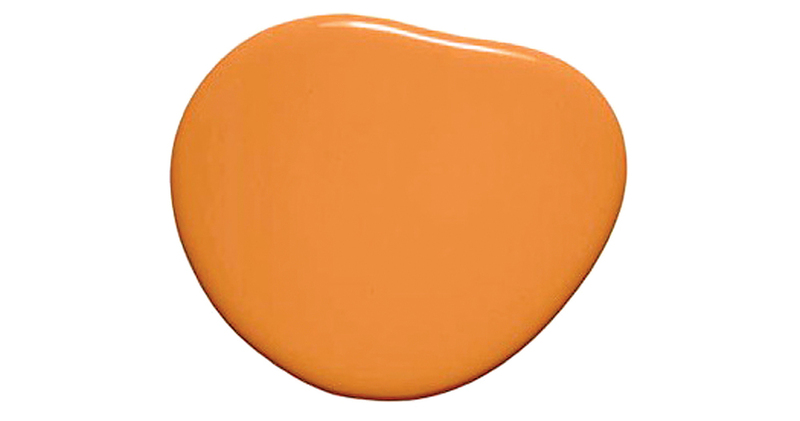 Pumpkin Blush by Benjamin Moore. Be careful to keep the decor really current, as this color can read "old" if not surrounded by fresh furniture and accessories. Now, into the rust family. These colors tend to work better with established, grand decor. I wouldn't pair a rust wall with dinky furniture. I'd use thick, distressed woods and lots of textiles. Not for minimalist rooms, in my opinion. Benjamin Moore Tandoori. Yummy for a dining room. Also, I wouldn't skimp on price when going with such a rich color. If it's between $30 and $60+ for a gallon in any given brand, go with the more expensive option. With such intense colors, you want to ensure good adhesion and durability.